Alice was in quite the mood yesterday. Early on she was cranky but as the day wore on she became much more animated and she demonstrated an amazing capacity for destruction. Her first target was her new Bitty Baby. 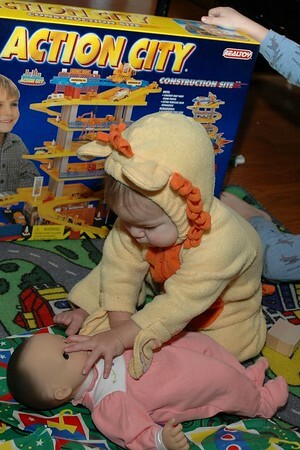 Alice reacted to the doll by patting it on the head and then trying to gouge its eyes out. Clearly Mom let Alice watch one too many Three Stooges movies. It’s also probably for the best that Alice doesn’t have any younger siblings. After the furor of opening presents we all went down to the basement to play with some of the new toys. Charles started with his new railroad track and Plan City roads. I used to think Alice just wanted to play with what Charles was playing with, but her mission was clearly to reduce Charles’ carefully constructed world to disorganized rubble. Even if Charles wasn’t there, Alice would scoot over and starting pulling up road and track, after scattering any parked cars or trains across the soon to be shattered landscape. She is also not content to grab a section or two, but will continue to pull up sections until there is nothing left together, stopped only by parental intervention. The next target was Corwin’s marble run, which we managed to save from the rampaging Alice-saurus only by constant effort. Eventually I had to take her back upstairs to prevent open sibling warfare. 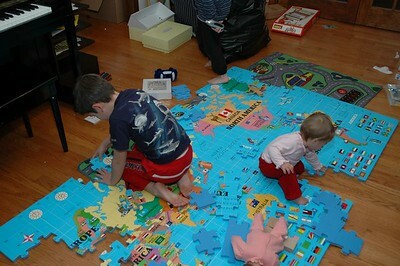 Later Mom got out a large foam map puzzle. 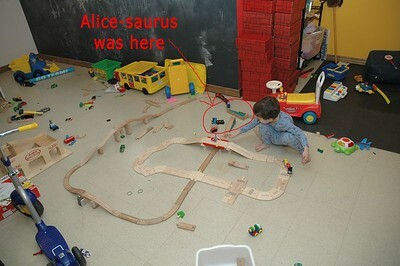 She and Charles started putting it together but they hadn’t counted on the Alice-saurus. Alice took one look and immediately started ripping out puzzle pieces. Corwin tried to help later and it was all he could do to put the pieces back as fast as Alice pulled them out. Alice would pause to gnaw on each piece only for a moment, returning rapidly to removing more pieces from the puzzle. If she was lucky, she could pull up entire sections at once for disassembly. I don’t remember the boys being quite that deliberately destructive. Their destruction tended to be more incidental. Alice just seems more focused on re-arranging her environment for the sake of re-arrangement. 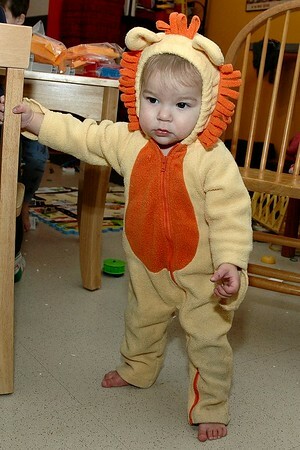 She’ll be a true terror once she is able to grasp the concept of “furniture”. Bix got a bitty baby for Christmas last year. He immediately started bashing its head on the ground. Maybe the first impulse toward bitty babies is to destroy them? Well, Alice tends to do that to anything that has eyes, although we’ve managed to convince her that it’s a Bad Thing to do to her brothers.